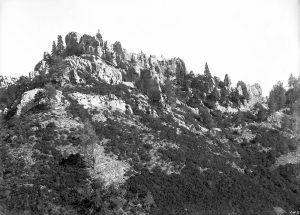 The UCMP archives contain no field notes of any of the expeditions that traveled up to Shasta County, however, the museum’s Supplemental Locality Files contain 32 negatives, three photographs and a couple drawings, and there are 14 Shasta County negatives in the Large Format Negative Collection. There are no dates on the negatives and prints but some are clearly from 1901 (see the photos of UCMP 9119 below). There isn’t a lot of information on the two 1901 expeditions or on the 1903 one — we don’t even know the names of most of the 1901 participants — but a few tidbits can be gleaned from Merriam’s publications and correspondence. Katherine Jones’s 1902 notes make a couple of references to the summer 1901 trip. 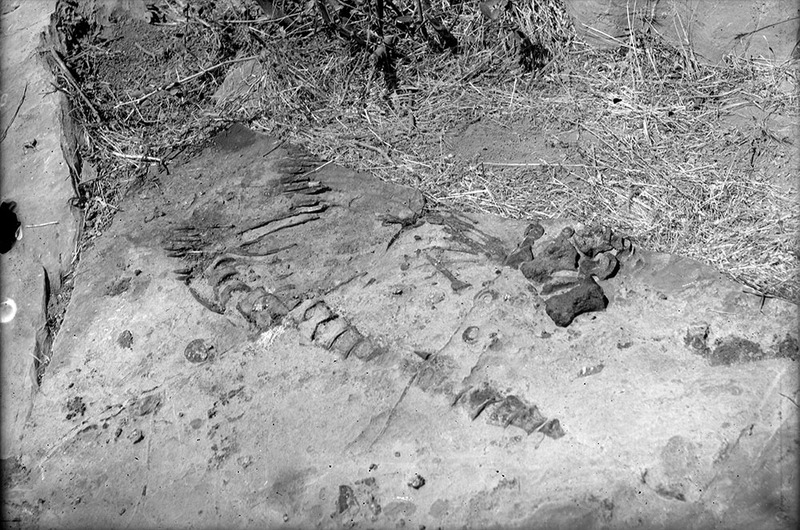 At the time of the summer 1901 trip, Annie Alexander was on her Fossil Lake Expedition in Oregon. Although she did not go up to Shasta County in the fall, she financed that trip and probably the 1902 and 1903 ones as well; she did participate in these latter two, making significant discoveries. A number of the participants in these expeditions have been profiled elsewhere in the UCMP History pages, but the newcomers will be profiled in these Shasta County pages. 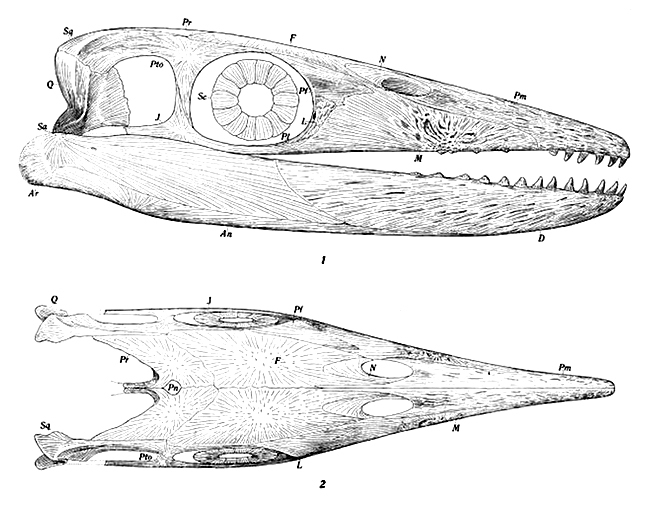 A restoration of the skull of Thalattosaurus alexandrae. From Merriam, J.C. 1905. The Thalattosauria: A Group of Marine Reptiles from the Triassic of California. Memoirs of the California Academy of Sciences 5(1):1-52. See Plate VI. 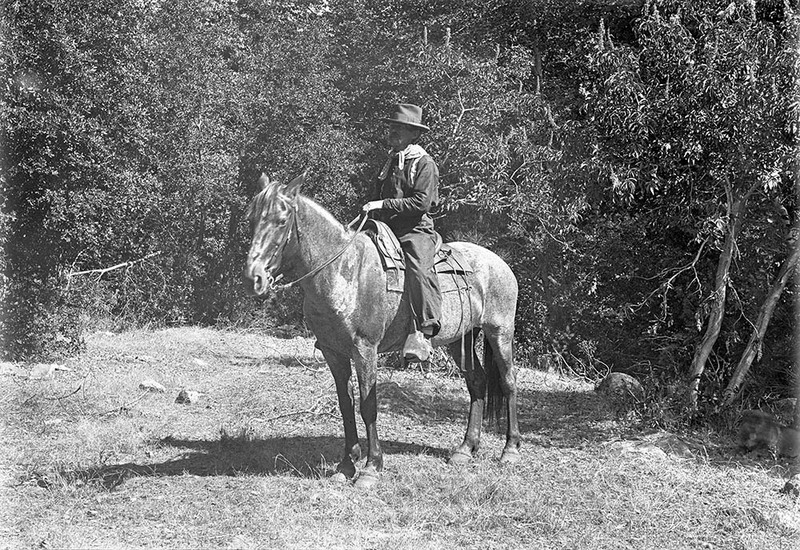 An expedition participant, most likely Merriam, on horseback. Look at the enlargement of this image and see if you can find the dog. Photo from the UCMP Archives. The 1902 expedition, with its much richer record and interesting aspects, is discussed here. A portion of UCMP 9119 as it was found, 1901. Photo from the UCMP Archives. We walked to Mr. Matteson’s [Madison’s] and sat under the same tree that the Professor James Perrin Smith party of the year before used to sit and smoke under every day because it was half way down from the cove [Smith Cove] to their camp at Matteson’s [Madison’s]. This party went up that trail every day for fossils and walked back again at night. This was done to please Professor Smith of Stanford who wished to reduce his weight. It is 2½ miles up the mountain trail and was enough to kill the men. Even Professor Smith had enough of it in six days. Whether the party decided to move its camp at that point is unknown. The fall trip, which lasted about eight weeks, was led by Herbert Furlong; the other participants in the expedition are unknown. Furlong had only recently returned from the 11-week Fossil Lake Expedition with Annie Alexander. 1901 was a busy year for Furlong, however, the Shasta County trip would be his last venture on Merriam’s behalf; the following year, his younger brother Eustace would take over Herbert’s role. But it’s likely that the Furlong brothers’ time in the Merriam Lab overlapped for at least the latter half of 1901 because Eustace was probably already at work preparing the Shasta County specimens. Shastasaurus perrini, UCMP 9119, from Merriam’s 1908 paper on Triassic Ichthyosauria, with Special Reference to the American Forms. This photograph shows the complete specimen. A section of UCMP 9119, stored in UCMP’s Type Room. Photo by the author. Expedition years from Hilton, R.P. 2003. Dinosaurs and other Mesozoic reptiles of California. University of California Press, Berkeley. 318 pp. See pages 129-143. Regarding MVZ’s copy of Jones’s notes, in 1934 MVZ’s Joseph Grinnell wrote to Jones following a conversation with her about having a copy made for the museum. “If you will deliver them [the notes] to his [a messenger’s] care, we will have them copied and return the original to you quite soon.” So the copy now in the MVZ archives was typed by an unknown person at the museum in 1934. A pdf of this typed document can be viewed online. Grinnell letter from the MVZ Archives. 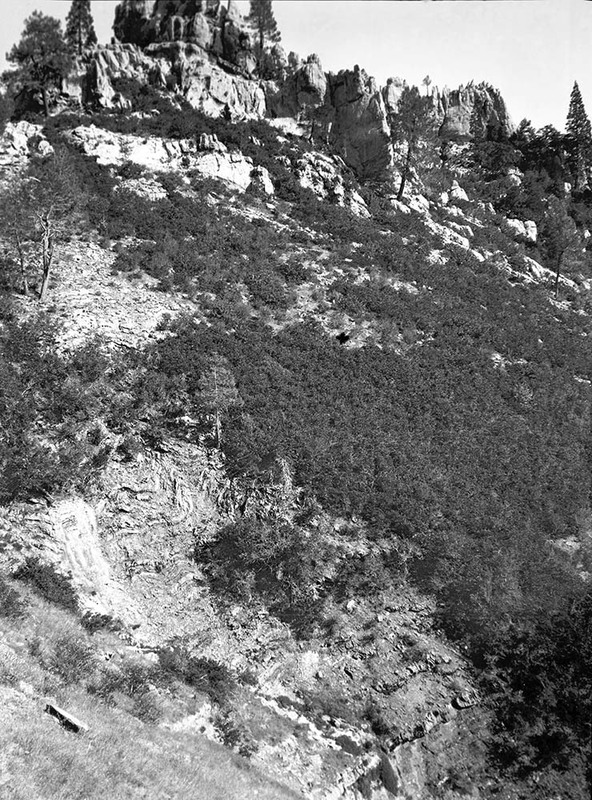 Regarding the Hosselkus Limestone, University of California officials in the late 1960s, citing the area’s paleontological importance, urged the state to provide an extra layer of protection to the area. In 1997 the area between the Squaw Creek and Pit River Arms of Shasta Lake was designated as the Devils Rock-Hosselkus Research Natural Area. See the Management Guide for the Shasta and Trinity Units of Whiskeytown-Shasta-Trinity National Recreation Area, page 2-24. Merriam, J.C. 1895. On some Reptilian Remains from the Triassic of Northern California. American Journal of Science, 2d series 50(395):55-57. Merriam, J.C. 1904. 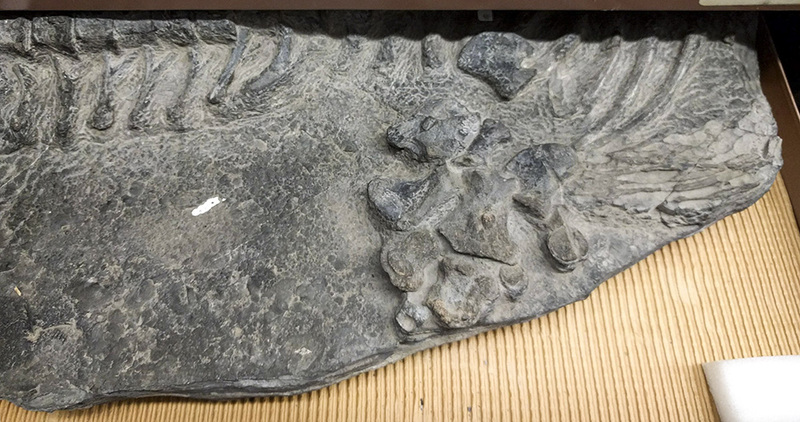 A New Marine Reptile from the Triassic of California. University of California Publications, Bulletin of the Department of Geology 3(21):419-421. Merriam, J.C. 1902. 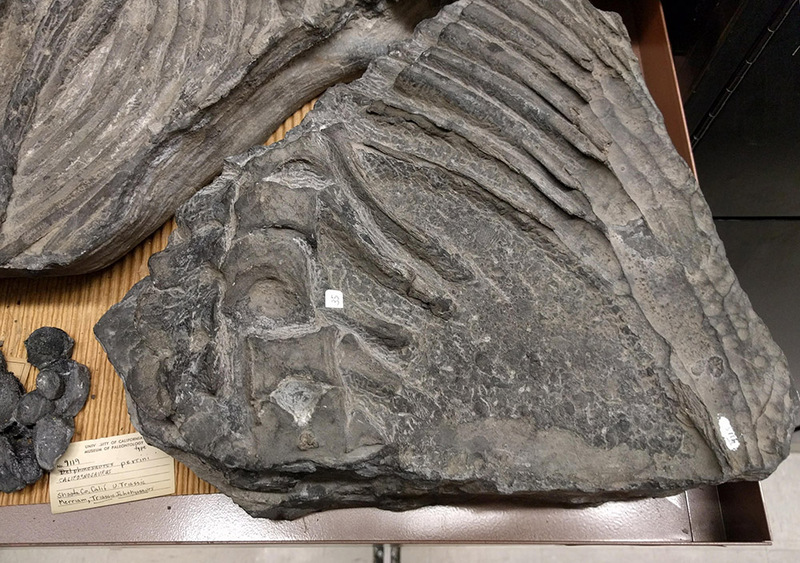 Triassic Ichthyopterygia from California and Nevada. University of California Publications, Bulletin of the Department of Geology 3(4):63-108. Quotes are from Merriam 1902, page 89. The thalattosaur paper is Merriam, J.C. 1905. The Thalattosauria: A Group of Marine Reptiles from the Triassic of California. Memoirs of the California Academy of Sciences, The Academy. 52 pp.